(Family Features)—When it’s time for a bathroom or kitchen upgrade, some of the greatest inspiration may come from another time entirely. Some of the most on-trend styles of today are actually throwbacks to bygone eras. Start by establishing a focal point for your retro-modern design, such as a functional nod to the past. 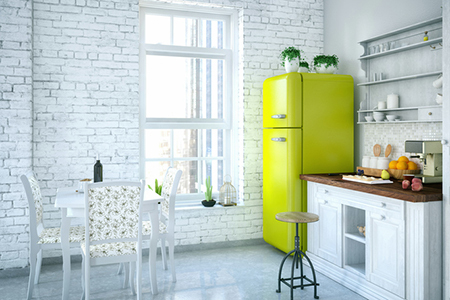 Long before modern refrigeration, iceboxes were used in many of the homes in the early 20th century to keep foods fresh. It’s possible to mimic this look with the Wellborn Cabinet Premier Series, to achieve an icebox look that actually functions as storage space. A beautiful, ornate bathroom with plenty of traditional features can truly be an interpretation of elegance in design. Plan for an abundance of luxurious, spa-like elements to achieve this look. Incorporate features such as warm hickory covering every inch of the walls and built-in lighting to set the tone for a relaxing atmosphere. Then incorporate antique-styled mirrors and glass hardware to create contrasts among the rich tones and texture. Let a large soaking tub take center stage between the sink vanity and a custom makeup area. While you can rely on cabinetry for functional features, it’s also a way to continue adding elegant touches, such as a beautifully crafted tub skirt and arch that complements the vanity area. No luxury bathroom is complete without a standalone makeup alcove outfitted with unique features like drawer dividers (perfect for hair accessories) and countertop hideaway cabinets. Consider creating a focal point using rounded spindles to create depth and allow the custom makeup section to stand out in the design. Lastly, embellish the distinguished look with molding options that highlight the feature areas and create a defined line around the room. Going to the extreme with your aesthetic with a retro design is all about fun, with features such as pops of color in the tile behind the vanities or fun and whimsical wallpaper. A 1950s-style bathroom lets you play on your childlike senses. From bright colors to mixed metals and textures, this unique design style pays respect to the era of carhops, Airstream Travel Trailers and Lucille Ball. When it comes to the vanities and cabinetry, remember that both style and color can bring your retro design together. Don’t be afraid to step outside more traditional wood tones, and use unexpected colors, such as the pink hue available in Wellborn Cabinet’s ColorInspire program. For the woodwork, look for details such as conical-styled, slender legs that add to the 1950s feel. Reminiscent of days past, a fabulous ’50s bathroom is the ultimate definition of an eccentric design. There’s no time like now to begin planning your on-trend home upgrades. Explore the latest styles and home design options at wellborn.com.